Mastering the temperature-induced morphology and porosity needs to fully understand how phase separation proceeds and to establish the relationship between phase separation mechanism and processing parameters during material preparation. For some years, we studied a neutral hydrosoluble polymer the poly(N-isopropylacrylamide) or PNIPAM. When aqueous solutions of this polymer are heated above a temperature of the order of 42°C, a phase separation occurs. However the PNIPAM does not follow the macroscopic phase separation. The phase separation stops at a stage where it leads to porous stable PNIPAM colloids (spheres having size of the order of 200 nm). A probable mechanism, consistent with the colloidal size variation with temperature, is that the phase separation is blocked at an early stage (Cahn regime of spinodal decomposition) by adsorption of residual ions at the grain’s surface. Our ultimate goal is now to make membrane manufacturing safer and more economic on atoms by using modified natural polymers like cellulose ethers and water as the only solvent, thus lowering wastes and recycling. Consolidation of the film structure is carried out by cross-linking. On the basis of their relevance for membrane preparation and accessible phase boundaries, the biocompatible and neutral polymer selected is the hydroxypropyl cellulose (HPC). Aqueous hydroxypropyl cellulose is a fascinating system which exhibits an isotropic phase in dilute solutions, but forms an ordered liquid crystalline phase with cholesteric structure in concentrated solutions at room temperature. As PNIPAM the HPC has a lower critical solution temperature (LCST) close to room temperature and it undergoes reversible phase separation upon heating. Phase diagrams of HPC solutions will be established and bulk phase separations will be studied to determine what kind of bicontinuous phases are obtained as a function of the temperature, concentration and time. The characterization will be done in a large concentration range in order to change the topologies of the predominant phase (in volume) rich in polymer or in solvent. Phase diagrams and bulk phase separations of HPC solutions will be studied by varying the physico-chemical parameters: degree of polymerization and polydispersity. The boundaries of the phase diagrams (cloud points) are determined by turbidity measurements. 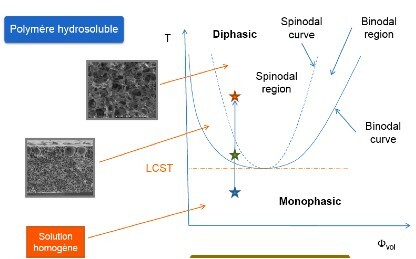 The morphologies and the growth laws with time of phases are established using scattering techniques (Neutron, Light, XRay), Diffusive Wave Spectroscopy, Optical and Confocal Microscopies (see Figure 1). Quantitative models will be proposed to rationalize the phase separation processes in order to provide roadmaps for membrane manufacturing. Cahn J.W. and J. E. Hilliard, Free energy of nonuniform system. I. Interfacial free energy, J. Chem. Phy. 28 (1957) 795. Lacaze, M.; Guenoun, P. ; Beysens D. ; Delsanti M. ; Petitjeans P. ; Kurowski P. Transient surface tension in miscible fluids. Phys. Rev. E, 82 (2010) 041606.